John Apps, originally a bricklayer, was by 1851 describing himself as a master builder who employed 4 men and 3 labourers. His premises in Church road can be identified today by the three figures, known as “Adam & Eve and the Soup Tureen”, adorning the outside of the building. 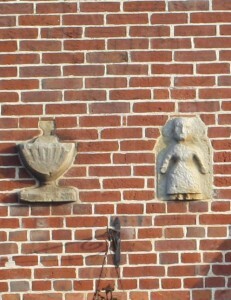 These were placed there by Apps as examples of his work as a stonemason and builder. After his death at the age 73 in 1866 his son William, whose previous occupations had been a cigar wholesaler and tea dealer, took over the business. In 1871 the firm employed 6 men and 6 labourers. Space at the Church road premises was limited, so their building materials (stacks of pipes, bricks etc) were stored across the road on the grass bordering the churchyard. His collection of firebacks was similarly displayed outside on the pavement. They were only removed after his death in 1901. William Colvill ran his business from premises in Cranbrook Road, near the Chequers Inn and was, possibly, the first of several firms to operate from the same address. In 1851, the census records him as employing 8 men and 1 boy. 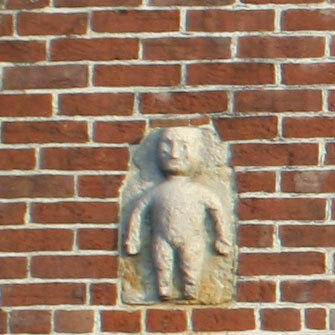 Little is known about his business but, he is thought to have built Goldwell, in Cranbrook road for William Burgess of Burgess Stores in the 1850s. By the time of the 1861 census as well as his building business he was also employing a further 2 men on his 26 acre farm – (it is not known which farm). He died in 1867 aged 65. 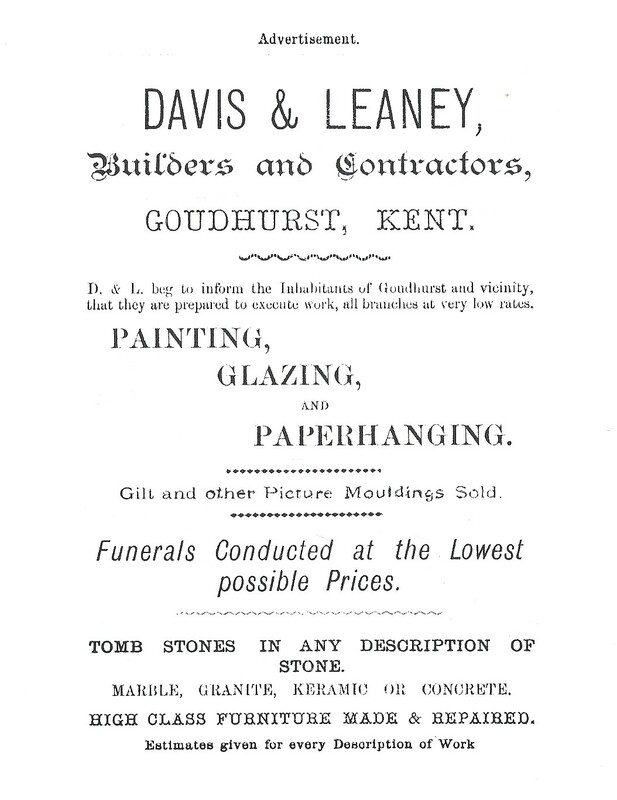 Frederick James Davis & William George Leaney operated the firm of Davis & Leaney from a yard behind Holly House, Cranbrook road from 1883 until the early 1930s. To begin with they employed about 8 men but this number grew as the business expanded and by 1913 they had 47 employees. Like their predecessors they also did work for the Burgess family; from making sugar-bins for the grocers shop to building a new shop front and veranda in 1888. No job was too small whether it was making crutches and croquet sticks or rabbit hutches and cartwheels. As well as these small jobs they also did a large amount of painting and decorating, mended burst pipes, made cupboards as well as general maintenance work for the tradesmen and inhabitants of Goudhurst. 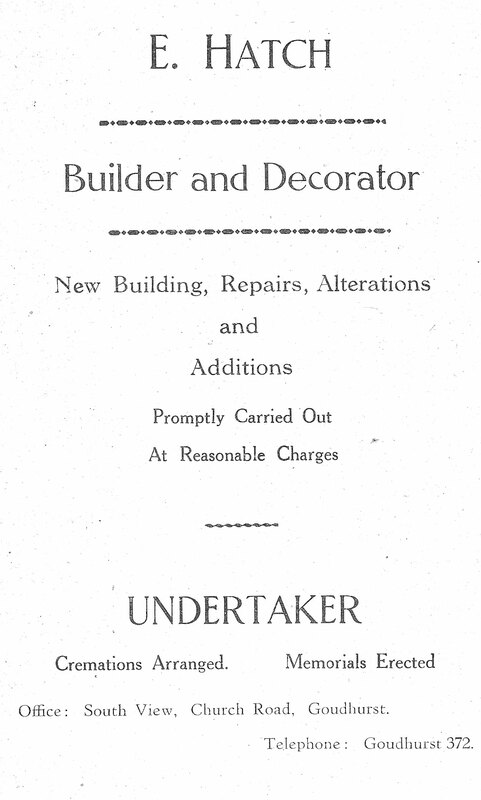 They were also the local undertakers, making the coffins, organising funerals and making the memorials. Leaney eventually moved to Southend-on-Sea where he ran a separate branch of the business. This arrangement was dissolved in 1904 and Leaney died in 1909. George Davis, son of Frederick eventually took over from his father. 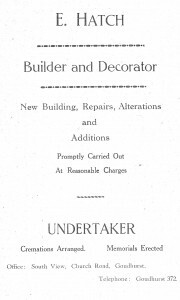 In about 1929 the name of the firm was changed to Davis & Leaney (Contractors) Ltd and shortly after that Charles F Trevor joined the board. Trevor eventually purchased the business and changed the name to Trevor Construction. 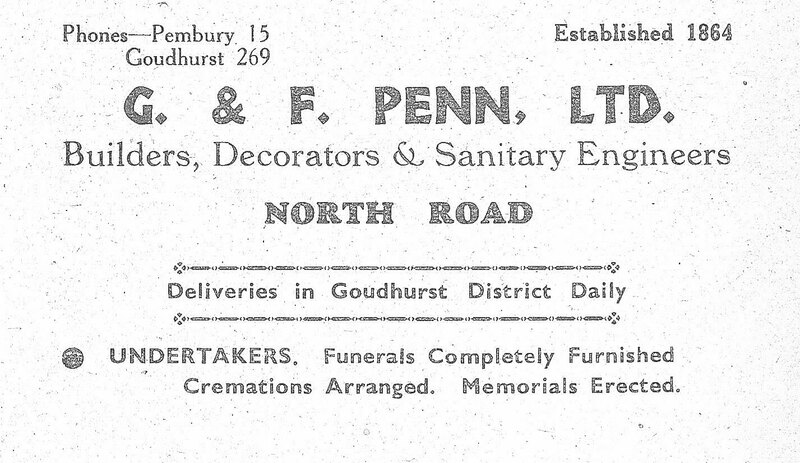 More information about the firm has been published in Goudhurst and Kilndown Parish Past. In 1972 the business records of the firm were given to the local history society. This extensive archive has now been deposited with the County Archives and can be viewed at the Kent History and Library Centre in Maidstone. Originally run by brothers Edward and Frederick Hatch from premises in Back Lane, Goudhurst who went bankrupt in 1938 and were finally discharged in 1940. The firm, however, carried on and in 1975 when a fire destroyed nearly all the workshops belonging to Trevor Construction, Hatches took over that business. The firm was still operating in the 1990s. 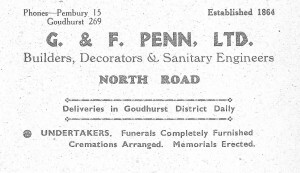 Established in 1864, by 1913 they were based at Curtisden Green, but had moved to North Road, Goudhurst by the early 1930s. Their business records covering the period 1890 to 1920 are held by the Kent History and Library Centre, Maidstone. Potter was succeeded by the firm of Norman Player who, in 1871 is shown as living next door to James Potter and working as carpenter. Player’s firm was considerably smaller, employing 5 men and 1 boy in 1881 and based at Holly House, which is opposite the Chequers Inn. His firm was also short lived and in 1883 was succeeded by that of Davis & Leaney. 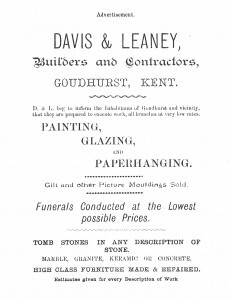 Colvill was followed by James Thomas Potter a builder born in Gravesend in about 1832. Census records indicate that Potter had lived in several places before moving to Goudhurst by 1865. The 1871 census shows that he employed 15 men and 2 boys from premises described as “near Chequers”. Surviving records show that he did a large amount of work for the Burgess family in the early 1870s. 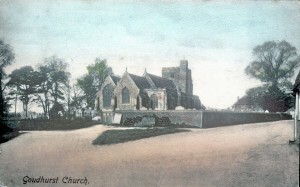 He had left Goudhurst by 1881.